@CityOfYpsilanti rec basketball team had our 1st practice. Need someone who can dunk. Settle for someone who didn’t get dizzy when they ran. You don’t have to be part of some league or federation in order to make maps. City Council is trying to do an end-around on medical marihuana. In November 2008, the voters of the State of Michigan voted overwhelmingly to create space in the law that provided for private use of medical marihuana. It was passed by the voters of Michigan by a margin of 63% in favor to 37% against. On a related note, instances of severe back pain have increased more than 750% since the law took effect. The Medical Marihuana Act is complicated, contradicting, and all-around horribly written. It’s so horribly written is because it was done by voter referendum. Laws that are enacted this way are usually incomplete. This law was no different. One of the most glaring absences in the MMA of 2008 was the law did not provide a definition of what a dispensary is or isn’t. As a result, local governments have been struggling over what to do with respect to their zoning laws. Some communities, such as Saline, have outright banned their existence. Others, like the village of Dexter, defined a dispensary in such strict terms that it doesn’t even make any sense for them to exist. Finally, communities such as Ypsilanti have opened their arms and their hearts and welcomed them. In fact, Ypsilanti was the first municipality in the State to license dispensaries and has become known throughout the weed community as a friend. The City of Ypsilanti created an ordinance that allowed for dispensaries to exist in the B2, B3, and B4 business districts. We also said they couldn’t be closer than 500 feet to an existing dispensary or within 1,000 feet of a school. These two parameters created a complex mathematical algorithm that effectively defined the maximum number of dispensaries that could operate within the city limits. Once a dispensary goes into one of the districts, the number of additional dispensaries is further limited due to mathematics and the 500 foot rule. As it stands today, there are six dispensaries licensed by the City. Two in the historic downtown, one in Depot Town, one on West Cross Street, and one on Ecorse Road. In addition to the dispensaries, there is one licensed grow facility. 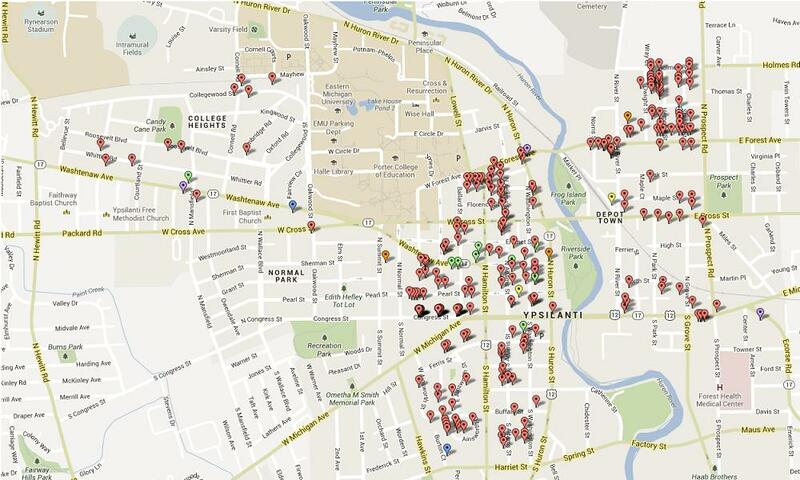 Due to the location of the two dispensaries in Ypsilanti’s historic downtown, the area cannot have any more legally licensed dispensaries operating there. Depot Town has one existing dispensary. Due to the 500 foot rule between dispensaries as well as the 500 foot rule between existing dispensaries as well as the 1,000 foot proximity rule to schools, Depot Town is capped on how many dispensaries it can accommodate. West Cross Street had the potential for two dispensaries, but once the existing dispensary opened at 513 West Cross, it eliminated the potential for any more to fit within that district. Ecorse Road has one dispensary, but could fit another if it were to locate in the vacant Taco Bell building at the corner of Ecorse and Mildred. I am personally rooting for someone to apply for a license and open a dispensary there if only to give us a perfect 10 out of 10 on the irony scale. Huron River Drive has one dispensary, but because of its location, the district could be home to three additional dispensaries if the stars aligned. It should be noted there is an application in process for a dispensary in that district that would reduce the theoretical number by one, but until that happens, the possibilities are limitless (or three in this case). There is currently an application in process for a dispensary at the old Red Line Auto sales on South Huron Street. There is also space available to fit two more dispensaries on West Michigan Avenue. 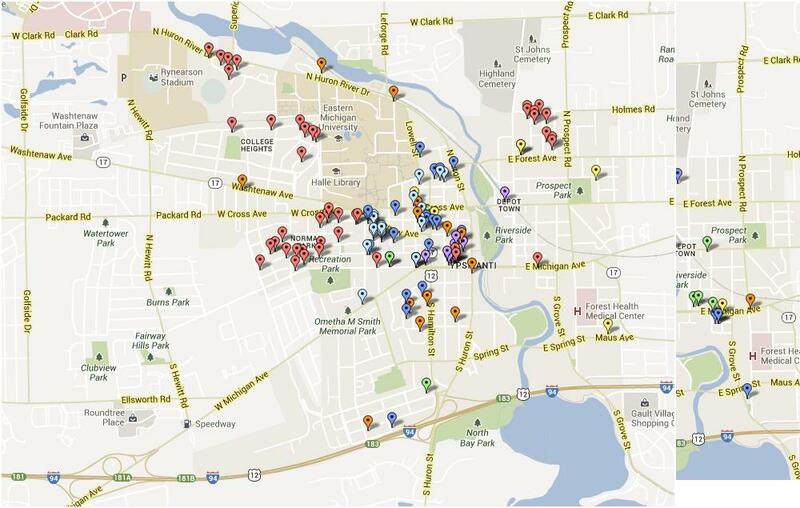 A dispensary could locate in either Brandy’s or Cal’s in addition to one more across from the Ypsilanti Police Department. These locations are all theoretical. If either the Brandy’s or Cal’s building were repurposed for the sale of weed only other location available for a dispensary would have to be the VFW building. As it is home to the VFW, it’s unlikely a dispensary would ever open there, but it is theoretically possible. It should be pointed out that during the great fight over Brandy’s Party Store, former Mayor Pro-Tem Trudy Swanson was famous for defending Brandy’s claiming that “Cal’s is too high” when referring to the prices at Cal’s Party Store & Deli. Again, it might be fitting if a medical marihuana dispensary were to locate in Cal’s so that the former Mayor Pro-Tem’s claims could still have as much meaning today as they did nearly four years ago. Finally, if City Council were ever to adopt zoning for Water Street, one additional dispensary could fit there assuming it was built at the location of the proposed recreation center. While this is highly unlikely as a destination for a dispensary, it is theoretically possible. For the purposes of this discussion, I could care less about grow facilities. The City has one licensed grow facility in the Industrial Park on South Mansfield and two applications in process for a grow facility on Railroad Street near VG Kids and another at the end of Catherine Street in the old clubhouse of the Iron Coffin Motorcycle Club. On May 21st, Ypsilanti City Council is poised to take action on an emergency moratorium on new dispensaries or grow facilities. Emergency ordinances are used to give the planning staff time to finish working on an ordinance. By the time an emergency ordinance is being proposed, staff has direction and is working towards a solution. This emergency ordinance is a complete end-around the process. Planning staff has no direction on how Council would like to set policy. More importantly, there isn’t enough time to finalize a solution. If Council were to implement an emergency ordinance at the May 21st meeting, the 60 day clock would begin. The next Planning Commission meeting is scheduled for June 19th. That means that notices for a public hearing need to be published 10 calendar days prior to the meeting. That means a public notice has to be published in the newspaper by June 6th giving the City Planner just nine business days to come up with a solution for Planning Commission consideration. In essence, Council would be making medical marihuana a higher priority than the Master Plan process, Water Street redevelopment, or Angstrom redevelopment (among other things). The Planning Commission would have to come to a consensus at just one meeting – no small risk considering how much time was spent on this topic the first time around. If Planning Commission came to a consensus, Council couldn’t take up this issue until the July 16th meeting because there isn’t enough time between the Planning Commission’s June meeting and the July 2nd Council meeting to public a notice for a public hearing. Finally, assuming Council could come to a consensus at only one meeting, Council would have to do another emergency ordinance to allow the new rules to go into effect. Council could make the City Planner’s workload a lot lighter if we chose to outright ban all dispensaries and grow facilities in the City. 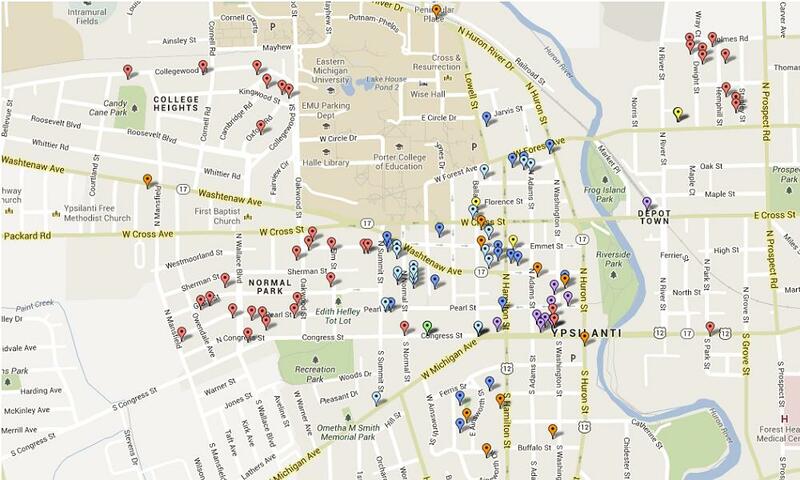 Existing licenses would be allowed to expire and would not be renewed, and Ypsilanti would once again be weed-free. The AnnArbor.com reported the main reason for this emergency ordinance is that of density. Unless you are using a definition for density that is not the real definition for density, that argument is complete baseless. As previously mentioned, there are two dispensaries and one growing facility in Ward 1 with a second growing facility having begun investing money in a building since having their site plan approved. There is also another dispensary rumored to be in the works. The dispensary at 19 North Hamilton Street is 2,569 feet away from the potential growing facility at 75 Catherine Street. It is also 5,893 feet away from the existing growing facility located in the Industrial Park on South Mansfield. The potential growing facility at 75 Catherine Street is 1,875 feet away from the potential dispensary located in the 600 block of South Huron Street. The dispensary at 50 Ecorse Road is 3,652 feet from the potential growing facility at 75 Catherine Street. Finally, the existing growing facility is 4,587 feet away from the potential dispensary located in the 600 block of South Huron Street. Ypsilanti is a really weird place. The argument that City Council is made up of a lot of old people more interested in NIMBY-ism and nanny-state policy-making is an offensive and lazy argument. People end up on City Council not because they are good decision-makers or can properly analyze data. They end up on Council because they want to help or give back to their communities. Or they are upstanding citizens who have been encouraged to get involved. As a result, you often get well-meaning people making bad decisions for the wrong reasons. The emergency moratorium is likely to go into effect on a 6-1 vote. It may not be the correct decision. It may not even be sensible or practical. But I can guarantee you it will have been well-meaning. If you can read a budget, this should be enough to give you an aneurysm. It’s not Robocop without the signature Beretta Auto-9. This summary provides information covering a 24 hour period beginning at 12:00AM through 11:59PM for 15 JAN, 2013. At 7PM this evening, Governor Rick Snyder will be delivering the 2013 State of the State address laying out his vision for 2013. If you’re like me, you’re very excited to hear what is going to happen; hoping all the while that we won’t have to wait until the last few weeks of the year for all of it to happen. Since there are drinking games for all sorts of nonsense (and I couldn’t find a drinking game for the State of the State address), it only seems fitting to have one for tonight’s festivities. Because of the breadth of topics, I am proposing there be both beer and hard liquor components to the game. One might think that because we live in the State of Michigan and have many craft beers to choose from, that I am recommending a local brew. To the contrary, I think it is only fitting that one should consider drinking a brew that is not made in a union shop or in a place where there are safety practices in place. All men have crimes, and most of them are hidden. This summary provides information covering a 24 hour period beginning at 12:00AM through 11:59PM for 14 JAN, 2013. This summary provides information covering a 24 hour period beginning at 12:00AM through 11:59PM for 13 JAN, 2013.